The TA400 articulated hauler is designed to meet the demands of the most extreme operations. Terex Trucks is gearing up to showcase its TA400 and TA300 articulated haulers on home ground at ScotPlant on April 20th and 21st. The Gen 10 machines will have pride of place on the Motherwell-based company’s exhibition stand which can be found at space D18. 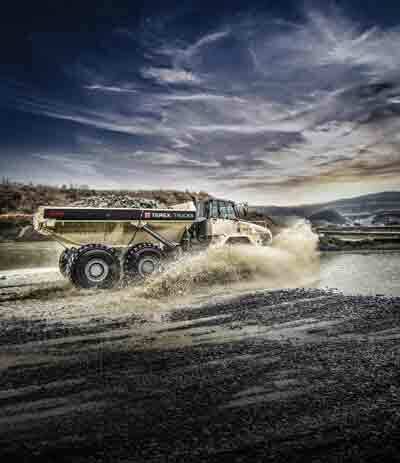 Joining Terex Trucks throughout the two-day event will be the company’s official UK dealer, TDL Equipment, which will be exhibiting nearby at stand D20. More than 4,000 construction trade professionals flocked to the last ScotPlant show, which took place in 2016. The number of visitors and the impressive names on the exhibitor list helped to reaffirm its reputation as an event where high-value deals are done. The biennial show will once again be hosted at the Royal Highland Centre in Edinburgh. Terex Trucks’ articulated haulers are known for their reliability, flexibility and performance in difficult environments. Designed to meet the demands of the most extreme operations, the Terex Trucks TA400 is a robust 38 tonne (41.9 tons) machine that excels in large-scale construction projects, quarries and mines. Powered by a six-cylinder Scania DC13 engine that boasts gross power of 331kW (444 hp) and a maximum torque of 2,255Nm, the TA400 offers superior traction and a power-to-weight ratio to match, ensuring material is moved quickly, irrespective of weather conditions and terrain. Clever engineering combines the benefits of lower operating costs with increased performance. The machine also features a spacious and ergonomically designed cab, complete with a commanding view for enhanced operator comfort. The TA300 articulated hauler is a proven performer in tough applications. The 28 tonne (30.9 tons) TA300 is a proven performer in tough applications, ranging from quarries to infrastructure developments and commercial projects. Giving the TA300 its power is a five-cylinder Scania DC9 engine, which provides 276kW (370hp) gross power and a maximum torque of 1,880Nm. The machine comes fitted with a transmission retardation system, in combination with an engine exhaust brake, which supports the fully enclosed oil-cooled multidisc brakes for maximum protection.